Nava Semel (1954-2017) was born in Tel Aviv. She had an MA in art history from Tel Aviv University and worked as a journalist, art critic and TV, radio and recording producer. Semel published novels, short stories, poetry, plays, children's books and a number of TV scripts. Many of her stories have been adapted for radio, film, TV and the stage in Israel, Europe and the USA. Her novel, And the Rat Laughed, has been made into an opera; it is also being made into a feature film, directed by David Fisher. 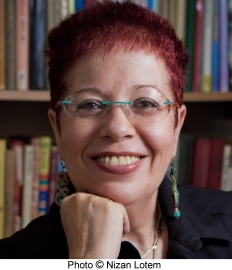 Her children's book, The Girl in the Gong, was performed on stage as a very successful musical in a co-production between Beit Lessin Theater and the Holon Mediatheque in 2012. Semel was a member of the Massua Institute of Holocaust Studies and was on the board of governors of the Yad Vashem Holocaust Museum. Semel received several literary prizes, including the American National Jewish Book Award for Children's Literature (1990), the Women Writers of the Mediterranean Award (1994), the Prime Minister's Prize (1996), the Austrian Best Radio Drama Award (1996), the Rosenblum Prize for Stage Arts (2005), and Tel Aviv's Literary Woman of the Year (2007). Most recently, her y/a book, Love for Beginners, received the One of the Best Seven Prize awarded by Radio Germany (2010) as well as the Educators and Scientists Association Award (Germany, 2010).